St. Mary’s Protestant Episcopal Church was begun on Classon avenue at the Wallabout, by the Rev. D. V. M. Johnson, while in charge of Trinity church. A Sunday school was established in March, 1836, and formed the nucleus of a church. Here the Rev. Mr. Johnson held services on Sunday afternoons for about six months. In May, 1837, Mr. Joseph Hunter took charge of the school, and served as a lay-reader to a small congregation which assembled with the children. During the year an edifice of a very limited extent was erected, and a church organized, to which the name of St. Mary’s was given. This was consecrated on the first of February, 1840, and was enlarged in 1841, so as to accommodate about two hundred and fifty persons. The parish grew rapidly during the following years, and the church was twice enlarged. In 1856, the Rev. Mr. Johnson, who was originally instrumental in forming the parish, became rector; and as the accommodations were no longer adequate, ground was purchased in the neighborhood, on Classon avenue, near Myrtle, one hundred and sixty-four feet front and two hundred and eighteen deep. The corner-stone of a new edifice of brown freestone was laid in the summer of 1858; and the neat and tasteful Gothic structure, designed by Mr. [Richard T.] Auchmuty, fifty-eight fleet wide and one hundred and fifteen feet long, with its tower and spire, and a capacious basement fitted up for the Sunday school, completed in the year following, and opened for divine services on Trinity Sunday. The outlay for ground and church was $32,000; the sittings are free. On the 24th of May, 1862, St. Mary’s was consecrated by the bishop of the diocese, the Rev. Dr. William F. Morgan, of St. Thomas’s church, New York, preaching the sermon. 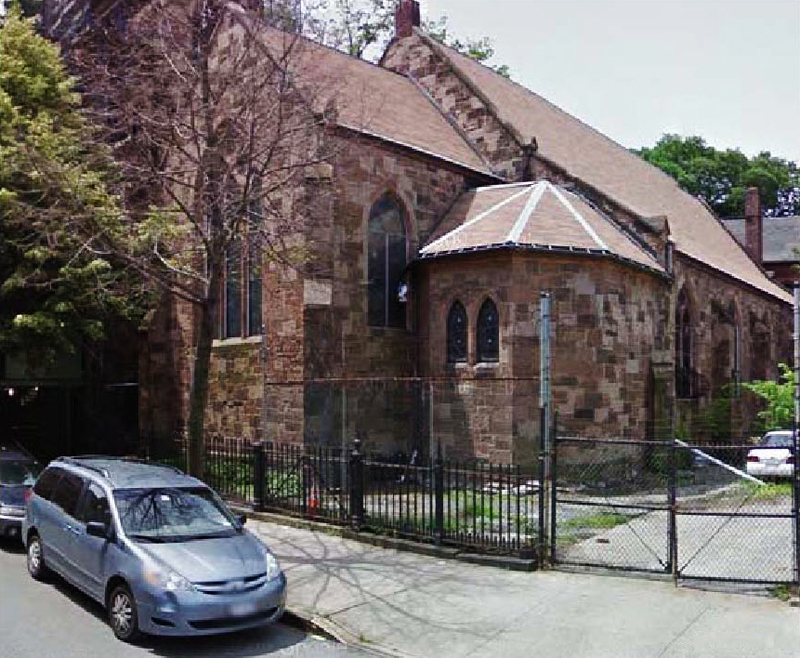 In 1981, St. Mary's Episcopal Church was designated a landmark by the New York City Landmarks Preservation Commission, and in 1983 the church was listed on the National Register of Historic Places. "Swell organ occupies the lower story in organ chamber at north side of Chancel; choir and enclosed great in second story, above swell; solo, double story at east end of chamber, with openings into chancel, and eight shades additional into church through great and choir chamber. Pedal pipes and all three great Open Diapasons on open chests in 10 foot extension into north aisle. Eight shades each for swell, and great and choir organs open into chancel, and eight others for each chamber open westward into nave of church. In all 43 shades, giving great expressive control. Chambers of heavy double woodwork with paper felt between, shades 2½ inch laminated, bevelled edges with heavy felt. The old casing was retained for reasons of sentiment. Console, of dark oak, stands at south side of chancel. A.G.O. pedal board." To operate full Great Organ except reeds. Hydraulic Engine (Forrester's Patent) to cellar of church, where are placed also four horizontal feeders, the wind from the same being conducted to the bellows in organ chamber. 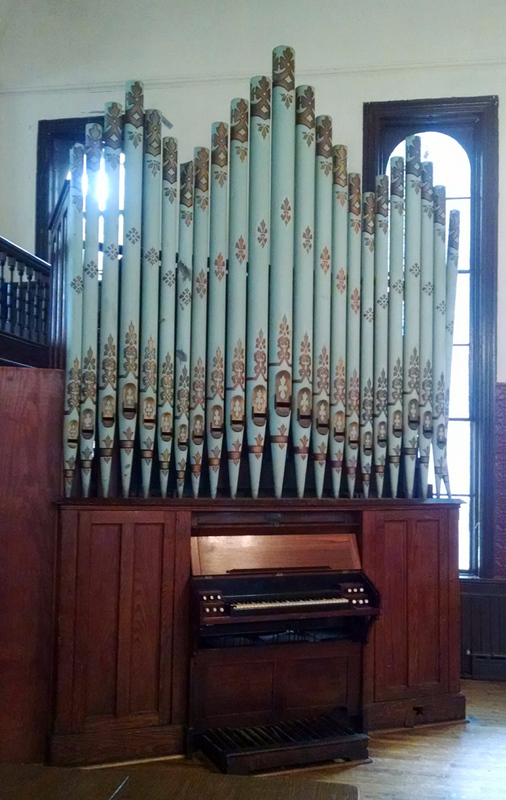 The organ in the Parish Hall was built in 1890 by L.C. Harrison & Co. of Bloomfield, N.J. This organ is extant but unplayable. [Blank] - 4' Flute Harmonic? "Grand Exhibition of the New Organ at St. Mary's Church" (May 9, 1871). Programme and Scheme of the Reuben Midmer & Sons organ (1870). Courtesy Larry Trupiano. Morrone, Francis. An Architectural Guidebook to Brooklyn. Brooklyn: Gibbs Smith, 2001. "Prower Symons' New Organ," The American Organist (May 1918): 270,275. Specification of M. P. Möller organ, Op. 2339 (1917). Courtesy Jonathan Bowen. Smith, Mark Victor. Specification of L.C. Harrison & Co. organ (1890). Stiles, Henry Reed. History of the City of Brooklyn, New York. Brooklyn: 1867-70. Webber, F.R. "Organ scrapbook" at Organ Historical Society Archives, Princeton, N.J. Specification of Reuben Midmer & Sons organ (1870). Courtesy Jonathan Bowen. The American Organist (May 1918). Console of M. P. Möller organ, Op. 2339 (1917). Courtesy Jonathan Bowen. eBay.com. Photo (1909) of church interior. Trupiano, Larry. Photo (2015) of L.C. Harrison & Co. organ.